Looking for things to do in Missoula? Look no further. Outdoor recreation, arts and culture, attractions, historic buildings, museums, the list goes on and on. Unexpectedly for a small town, Missoula always has something happening. Find out where to go and what to do in just a few clicks. Missoula is rich in arts and culture. You'll surely be able to find something to keep yourself entertained. Entertainment in Missoula isn't hard to find, there is always something going on. Missoula is filled with things to do in the great outdoors. One could say that outdoor recreation is our specialty. While in Missoula during the summer, water activities are an ideal way to cool off. Surrounding rivers and lakes provide plenty of opportunities to kayak, raft, stand-up paddle board and more. Get out there and explore all that Missoula has to offer. Come find fun in the snow in Missoula this year with winter activities like skiing and snowboarding, snowmobiling and even snowshoeing. With all the possibilities, there is no reason to stay inside. Get out there and create your own warmth while having fun at the same time. Food and drink in Missoula is an experience. Missoula is filled with a variety of culinary treasures. From fine dining restaurants to food trucks - you'll find it here. Breweries in Missoula have a variety of local flavors sure to satisfy the beer-lover in you. Feeling thirsty? Come taste what Missoula has to offer. Looking for things to do in Missoula? 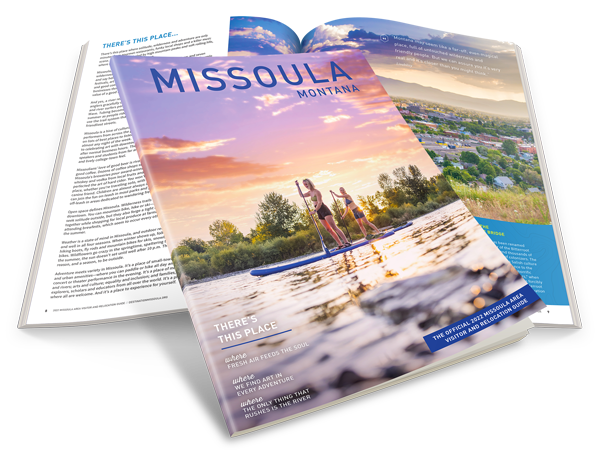 Missoula has Historic buildings, splash parks, the great outdoors, museums... The list goes on and on. Here are a few 25-Things-To-Do lists to get you started. Wildlife watching in Missoula requires vigilance, a deft eye and a clean pair of binoculars for optimal viewing. Keep your eyes peeled for bald eagles, osprey, deer, bighorn sheep and the rest of these animals in Missoula and the surrounding wilderness. Shopping in Missoula is broken up into three distinct areas, each with a variety of shops and goods. Montana has no sales tax so... go ahead and splurge. It wouldn't be a trip to Missoula, or Montana, without a fishing adventure. We've all seen the movie, A River Runs Through It, right? Fishing is absolutely central to this community. Wineries in Missoula offer tours, wine tastings and entertainment. Stop by for a glass of the latest selection while you're in town. Take a day trip from Missoula to explore the rest of Montana's Big Blue Sky. No matter which direction you are headed, there are treasures out there to be discovered around every corner.